A short #FridayOldFashioned post for the Friday before Christmas – traditionally a day when carnage is wreaked up and down the High Streets of Britain as office workers go wild with stick-on antlers and snowman deeley-boppers. Combine a barspoon of gingerbread syrup*, two ounces of whiskey and a sploosh of bitters in a mixing glass. Add ice and stir well for sixty seconds. 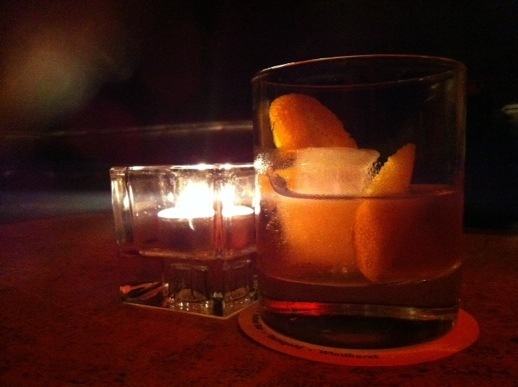 Strain into a chilled old fashioned glass, over ice. Garnish with an amaretto cherry (Christmas tincture optional). * You can make your own by adding ginger and cinnamon to a basic simple syrup recipe (follow Nigella’s recipe here) or use the pre-mixed Starbucks or Monin versions that are reasonably easy to find in the shops at this time of year.